Coach headed up to the hotel room. Tank and Reggie were still lingering. I had promised them an ice cream treat on the way back up to our room, since being brothers at these all-day dancing events leaves a lot to be desired. I unzipped my sweaty, breathless kid from her dress and folded it into her bag. She wanted to take her hard shoes off. Putting hard shoes on is a process. 'Can't you just keep them on until awards?' I begged. She shrugged, agreeing to keep them on. But it wasn't Emily whose set was in question. It was Curly's set. Someone had called to alert the officials that Curly wasn't allowed to do a hornpipe based set. She was supposed to do a treble jig based set. Long story, but it was a new rule, and Cara hadn't realized that it applied to this competition. The other teachers from other schools who she was sitting with were also unaware of the new rule. Their dancers had just happened to learn a treble jig based set, so they were in the clear. I was dumbfounded. My hands shook as I zipped Curly back into her dress. Thankfully her hard shoes were still on her feet. Cara kept grilling her. 'Think, think.' I actually believe that she was saying this more to herself than to Curly. 'Do you remember this step?' Cara used her hands to 'dance' the step out on her abdomen. Curly groaned, 'Um, just the beginning part.' Once Curly admitted that she still remembered her trouble jig steps that she hadn't practiced since November, Cara steered her to the back stage area. I followed. I assured Curly on our short walk, 'It's going to be fine. Just do your best.' Curly was still crying. Her hands shook as she wiped away her tears. I entered the black curtained area. Cara turned to me and looked surprised that I was still following them, 'No parents allowed back here.' 'I'm going to stick around until she's done crying,' I insisted. Curly has one of the worst possible birthdays in the world of Irish dancing. December 19th. The cut off is January 1. Had Curly arrived a few weeks later, she would dance as one of the oldest in her competition. Instead, she is one of the youngest. Performing a dance for 7 judges even though it hasn't been practiced in 7 months would be tough for any dancer. But this whip-up-a-dance-on-the-spot was being required of one of the youngest competitors in the under 10 competition. My 9 1/2 year old was not going to stand behind a black curtain and sob without her mother. I grabbed Curly's face. 'Take a deep breath. No more crying. Do whatever Cara tells you. You'll do great.' 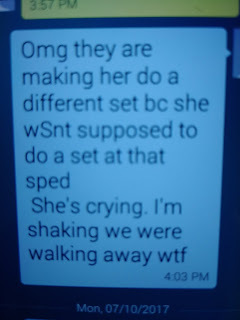 Then I walked back to my seat where I used my very shaky hands to text Coach, 'OMG she's dancing again in a few minutes. 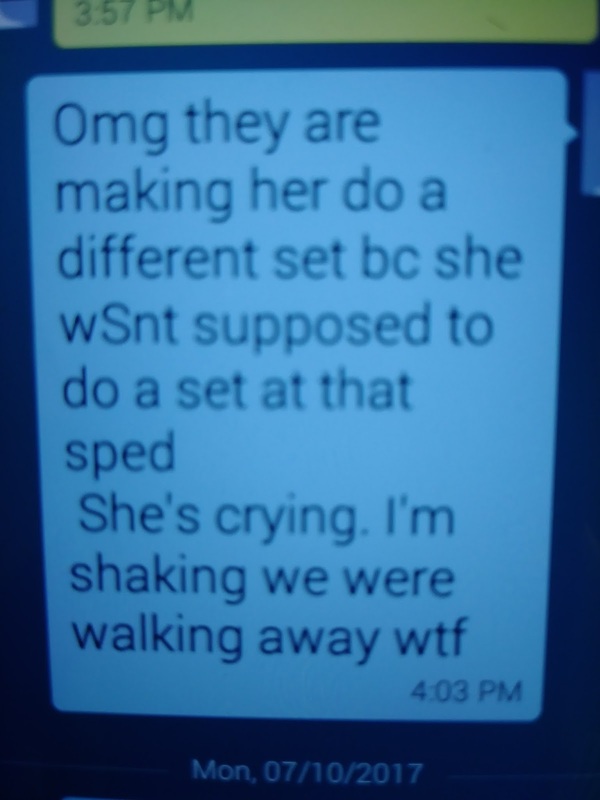 Her set wasn't allowed.' Then I texted something similar to my sister. Text to Coach while I was FREAKING OUT! I sat nervously next to Mini wondering how this was going to go. A few minutes later, Coach surfaced from our room on the 24th floor. His face was contorted to say 'What the heck?' Just when I think I've explained the process to him, a loophole like this crops up. A major setback for his Irish dancing comprehension. Cara appeared from back stage. 'She's going to do fine,' she assured me. Then it happened . . .I promise the last post about this epic dance competition is heading your way next. Oh, that sounds SO unfair - particularly since she's not an older dancer!